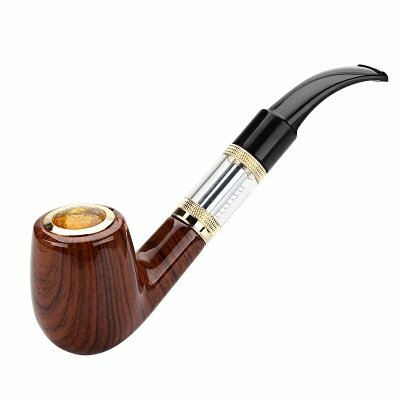 Successfully Added E-Pipe 618 Electronic Cigarette - Authentic Pipe Design, Wood Effect Finish, 510 Thread, 2.4-Ohm to your Shopping Cart. If you are a vaper that is looking for something different and unique, then the E-Pipe 618 is the perfect e-cig for you. Featuring a stylish design in the form of a traditional and old-school pipe, this electronic cigarette truly sets you apart from the crowd. It has been crafted to have the look of a real wood finish, giving it a high-quality and authentic style and feel. Perfect for begginer and advanced vapers alike, this sophisticated e-cigarette is sure to meet all your vaping demands. It even gets shipped in a beautiful presentation box, making it the perfect gift that is guaranteed to put a smile on the faces of all vape lovers out there. Thanks to its large tank, this box mod kit can be filled up with plenty of your favorite tasting e-liquid. The unique design of the tank features a little measuring scale at its side, keeping you constantly updated on the amount of e-liquid left in your tank. Powered by a regular 18350 battery, this e-pipe packs plenty of power that takes you through multiple vaping sessions without needing to worry about running out of juice. Simply fill up your tank, sit back, and enjoy a tasty vape filled day. Featuring a 510 threat, the box mod can be used with the vast majority of tanks and atomizers out there – allowing you to replace its current tank and customize it to your personal liking. With its 2.4-Ohm resistance, this e-cig allows you to enjoy tasty vapes and produce exceptionally large vapor clouds. Not only the unique design of this e-pipe will grab the attention of people standing by as, with this powerful vape mod kit, you’ll be able to create vapor clouds like never before. No matter your vaping style, this e-pipe is guaranteed to meet all your demands – making it the perfect electronic cigarette for anybody out there that is looking for a cool vaporizer that lets them vape the day away in style. The E-Pipe 618 comes with a 12 months warranty, brought to you by the leader in electronic devices as well as wholesale electronic gadgets..